Music reality TV shows and live performances resonate across India, opening new opportunities for singers. For a full season, Anju Joseph sang. Grabbing hearts in Kerala and the Malayalam-speaking TV audiences as far as Chicago and Sydney. The 20-year-old petite contestant on the Idea Star Singer music reality show on Asianet, the Star TV-owned Malayalam channel, made it to the finals but did not win the title and the Rs 1-crore villa prize. She has few regrets though. The show has made her a busy singer today, doing a show or two in West Asia and making close to Rs 2 lakh every month. Plus, a dozen CD releases in six months. "I accept events only on weekends and holidays," says Joseph, a BA student from central Kerala's Kanjirapally town. She plans to become a full-time singer after her studies. Music reality shows, which began with the simple format of Antakshari on Hindi channels, have captured the imagination of TV audiences across India, and matured in scale and grandeur. Zee TV was the first satellite channel to launch a music reality show 15 years ago. The programme, SaReGaMaPa, started in 1996 and has so far completed 1,040 episodes. It started as a weekly programme and was later made twice a week. TV exposure helps singers cross the hurdle of anonymity. This will accelerate as channels discover music is the second best revenue earner after soaps. In recent years the format - a singer mostly accompanied by a live orchestra - has exploded across TV audiences countrywide, being copied across language channels and watched by millions. In doing so, music reality shows have also become roaring businesses for the channels. "What we started as a 60-minute weekend show, Star Singer, is now a 90-minute weekday show, thanks to its popularity,'' says B.S. Praveen Kumar, Public Relations & Chief Manager, Telecast Coordination, Asianet. Surging viewership means fat revenues for TV channels. On Zee TV, for instance, SaReGaMaPa commands a sponsorship of Rs 2 lakh per episode. A 10-second advertising slot on the music show goes for Rs 1.6 lakh versus Rs 1.5 lakh for a popular-rated soap. "Reality shows always command a higher premium because of the celebrity and glamour factors," says Joy Chakraborty, Chief Revenue Officer and Chief Operating Officer niche channels, Zee Telefilms. More and more channels have discovered that music is the second best revenue earner after the daily soaps. Sun Network's Senior Vice President K.Vijay Kumar says U2, its threeyear-old Kannada music channel, is profitable. Though this varies widely, music labels are paid approximately Rs 25,000 per track by the channels. The people gaining the most are singers and musicians themselves. SaReGaMaPa discoveries Shreya Ghoshal and Kunal Ganjawala have gone on to become playback singers. Shekhar Ravjiani of Vishal-Shekhar fame emerged on the show and is now a sensation in Bollywood. Kamal Khan, winner of the recently concluded season, sang a song for the Farah Khan-directed Tees Mar Khan even before he won the contest. Examples abound. Television exposure helps singers cross the first big hurdle - of anonymity. "In Chennai, many singers have just four movie songs to their credit, but they are recognised, and are busy performing at events," says Aldam Jacob, Head of Non-Fiction, Sun Network. On a recent weekday evening in India's most crowded city club, Blue Frog - as much an upmarket watering hole as a live music venue - it was evident that another business model is emerging. Some 300 blues enthusiasts in Mumbai were crammed in to listen to Luke Kenny Mojo Jukebox. A few months ago, 850 people thronged the city's Hard Rock Cafe when Indian Ocean brought its show to town. In the past five years, business has been looking up for live bands in India as more bars and restaurants have turned to live music as a differentiator. "Without a doubt, bands are real crowd pullers," says Carlton Braganza, owner of Opus Bar and Restaurant in Bangalore. Jay Singh, co-founder of JSM Corporation, the franchisee for Hard Rock CafÃ© in India, believes today it is possible for a musician to survive without a day job. Singh's own chain hosts 360 shows a year. While top bands such as Indian Ocean charge about Rs 5 lakh a show, other established ones get anything from Rs 20,000 to Rs 1 lakh; new bands start at Rs 10,000 for an evening at established joints in the big cities. Sarosh Izdeyar, 39, took the plunge into music in 1997 after a 30-month stint as a marketing executive. "The initial years were a struggle but I was clear I did not want to pursue higher studies," says the guitarist for The One Night Stand. Initially, he made Rs 500 a show, but today earns 20 times as much. Bollywood live shows with stars like Shaan and Shankar Mahadevan pay several times over. The going is not always smooth and easy. 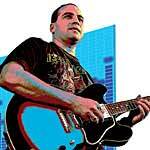 Howard Periera quit his back-office job with JP Morgan a year ago to pursue a career in music. As a BPO worker, he made Rs 40,000 a month and now makes half that, playing with two bands. The gain, he says, is that he is doing what he always wanted to do. Clearly music is emerging as a realistic career option, thanks to a combination of TV shows and live events. For young musicians, pursuing their art no longer means a life of austerity.